Black bladed trauma shears are perfect for tactical situations as they reduce shine but still allow for the identification of body fluids during primary surveys and when accessing the wound site. These Shears are made of German Quality Stainless Steel and feature tough plastic non-slip handles in a range of colours. 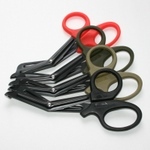 The shears have an overall length of 190mm and weigh in at just over 50g making them a practical addition to a personal Medical Pack, a TCCC pouch or jump kit. Light enough to not burden the user but tough enough for the removal of combat clothing and load carry equipment.